Founded in the 1920s by art collectors, the 3 star Hotel Hannong is an architectural masterpiece. Its founders, the Horn brothers, had designed the art-nouveau Aubette building on the Kleber square together with Sophie Taeuber-Arp, Jean Hans Arp and the architect Theo van Doesburg. The name "Hannong" is derived from the dynasty of porcelain manufacturers who had there workshop on the site which now houses the hotel. Their works are on display throughout the hotel. 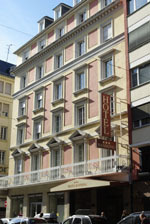 The Hotel Hannong is conveniently located in the city center of Strasbourg. With the historical Petite France quarter within spitting distance, and the cathedral less than ten minutes walk away, it is ideal for touristic visits. Shops and restaurants of all kinds can be found in the vicinity. A walk to the train station will take ten to fifteen minutes, a taxi slightly less. The Hannong's wine bar and lounge is unique to Strasbourg. Its sommelier proposes the right wine for every taste, bottled or by the glass. In addition, events such as wine tastings and jazz concerts are organized on a regular basis. For architecture fans, the salon Horn with its 1930s glass ceiling and Alicante marble floor is worth special attention. Together with the wine bar, it can be rented for receptions and cocktail parties. Another gem is the summer terrace with its lighted glass flooring. Breakfast, served in the breakfast room, is continental style and not included in the room price. Of the 72 bedrooms subdivided into different categories, one part is renovated in a modern style, while the other part has a classical Alsatian interior. The room size differs substantially between the different categories. All rooms have high-quality hardwood flooring. The rooms are equipped with air conditioning and heater, telephone, radio and LCD television receiving 30 international channels, but no mini bar nor safe. Bathrooms are equipped with shower or bathtub and hairdryer. The front desk is open 24 hours a day. English and German speaking staff help with dinner reservations and touristic inquiries. While the Hotel Hannong does not have its own parking space, a nearby public parking lot can be used at a reduced charge. As most of Strasbourg's city center is purely pedestrian, guests will need their car only for exploring the villages of the Alsatian Wine Road. For business meetings the hotel offers two conference rooms, which can seat up to 70 people, or be broken up in smaller meeting rooms.